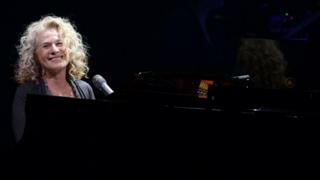 Carole King is to play her first UK concert in more than 25 years at the BST festival in London's Hyde Park. The singer-songwriter, 74, will play her seminal album Tapestry in full, followed by a selection of other hits. It will be the first chance to see King play the UK since her City Streets tour reached the Albert Hall in 1989. "I can't wait to perform Tapestry from beginning to end for the first time... in the heart of one of my favourite cities," said the star. The concert takes place on 3 July, with headliners on other nights including Take That, Florence + The Machine and Kendrick Lamar. Speaking to BBC 6 Music, the singer said it "actually wasn't my idea" to play the album in full, but "no-one has ever thought to ask [before] and I loved the the idea." "I'll be adding other songs because it would be a very short set if I only did Tapestry," she continued. "I might actually even have it on my social networks where people can offer up their favourites and see if we can get a consensus and help me figure out which songs to add." "The whole thing is very exciting to me," she added. "I'm really looking forward to it." Recorded in the hippie utopia of Laurel Canyon in 1971, Tapestry featured a dozen classic songs, including It's Too Late, I Feel The Earth Move and You've Got A Friend. Intimate and emotional, the record made King a star - but avid fans knew she had already been an enormously ­successful ­songwriter for more than a decade, writing hits like The Loco-Motion, Pleasant Valley Sunday and I'm Into Something Good with her lyricist ­husband Gerry Goffin. She put her own stamp on some of those earlier songs - including (You Make Me Feel Like A) Natural Woman and Will You Still Love Me Tomorrow - on Tapestry, which spent 15 consecutive weeks at number one on the Billboard 200 and was, until Thriller, the world's biggest-selling record by a solo artist. Tapestry also became the cornerstone of King's career as a performer and, more recently, of her jukebox musical Beautiful, which opened in London last year. Reflecting on the album's impact, King told the BBC: "I think the songs speak to people's humanity - to their deepest feelings of love and longing. "And with all the tumult in the world at any given moment, it's nice to touch that humanity." Support for the UK gig will come from Don Henley, formerly of The Eagles, and King's own daughter, Louise Goffin. Tickets go on general sale from Friday, 11 March, priced between £60 and £249.